New Competition from NWTT Timber Supplies - Name our Bear! In December, NWTT Timber Supplies ran a competition in which the fantastic prize of a DeWalt Brushless Kit was awarded to one lucky winner. A picture featuring the winner receiving his prize was published which got a lot of attention from our customers, though not for the reasons you may imagine! In the background of the photograph, calmly, quietly and unconcernedly taking all the attention from our winner, stands the NWTT bear, a mansize sculpture crafted from our fine timber. 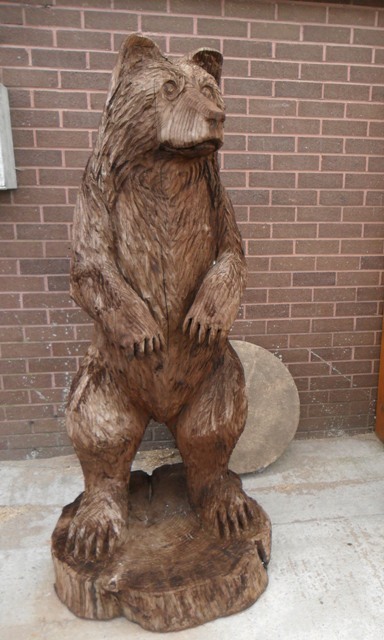 The bear has stood for many years in our timber yard and when we received emails enquiring about it, we were embarrassed to admit that it has never been given a name! So it is time to clear the matter up once and for all with the fantastic Name-the-Bear competition from NWTT Timber Merchants. To enter the competition and win the prize of our Cuddly Polar Bear Teddy, look out for our post on Facebook. Click ‘Like’ and then type your bear name suggestion into the comments box. On January 29th, we will carry out a random draw and the bear’s new name (along with the winner’s!) will be announced on January 30th before 5pm. If the lucky winner has chosen the same name as any other entrants, these will be placed into a secondary random draw to fairly determine the ultimate winner. Good luck to all entrants and we look forward to officially christening the NWTT Timber Merchants Bear before the end of the month!